Genuine OEM HP Ink Cartridge, Tricolor, 165 page yield. Single cartridge contains Cyan, Magenta, and Yellow ink. HP part number: HP 22, C9352A, C9352AN, C9352AN#140. Remanufactured HP Ink Cartridge, Tricolor, 165 page yield. Single cartridge contains Cyan, Magenta, and Yellow ink. Replaces HP part number: HP 22, C9352A, C9352AN, C9352AN#140. Remanufactured HP Ink Cartridge, Tricolor, 400 page yield. Single cartridge contains Cyan, Magenta, and Yellow ink. Replaces HP part number: HP 57, C6657, C6657AN, C6657AN#140. 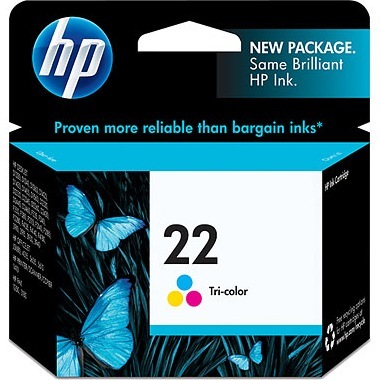 Remanufactured HP Ink Cartridge, Black, 220 page yield. Replaces HP part number: HP 27, C8727A, C8727AN, C8727AN#140. Remanufactured HP Ink Cartridge, Black, High Capacity 600 page yield. Replaces HP part number: HP 54, CB334AN, CB334AN#140. Remanufactured HP Ink Cartridge, Black, 520 page yield. Replaces HP part number: HP 56, C6656, C6656AN, C6656AN#140. Remanufactured HP Ink Cartridge, Photo Color, 140 page yield. Single cartridge contains Light Cyan, Light Magenta, and Black ink Page yield of 140 based on 4" x 6" color photos. Photo Cartridge replaces Black Cartridge when printing photos. Replaces HP part number: HP 58, C6658, C6658AN, C6658AN#140.